For a definition of ‘small’, I am referring to very small cruising sailboats, i.e., ten feet long or shorter. I am prompted to this discussion about sailing upwind in small yachts because the topic has cropped up on the Around-in-Ten web site (Shortly to be closed.) Large yachts specifically designed for sailing upwind have the power and performance to do it. Chay Blyth proved this when he sailed his yacht ‘British Steel’ around the world non-stop against the prevailing winds, and in so doing he became the first circumnavigator to succeed. It’s obvious that his 59 foot yacht would be more suited to the task than a ten foot boat; not that anyone would be so stupid as to attempt a circumnavigation against the prevailing winds in one. However, there are a few sailors who fancy their chances of beating Serge Testa’s record of sailing the smallest boat around the world. In the main, his route took him with the winds, rather than against them. These hopefuls who would challenge Serge have to make judgments about the configuration of their minuscule yachts. To succeed, they must have boats up to the task, but perhaps the most importantly they themselves must be capable of meeting the physical and mental demands. 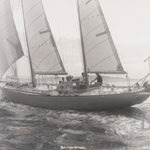 Serge’s ‘Acrohc Australis’ was capable of sailing upwind in pretty rough conditions, but while doing so she resembled a dolphin under the water for much of the time. The fact that she could be sealed from the elements was part of her success, but as expected, the going was tough. Serge had to be pretty fit to survive. 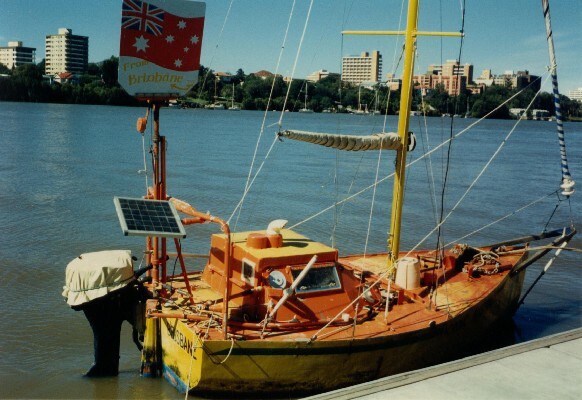 He was glad that ‘Acrohc Australis’ was a good all-round boat that could perform well on any point of sailing. He was especially thankful when beating into the Pacific from the Panama Canal, because had she not had windward capability, he may not have made it into the history books. Any challenger should consider the essential features to be incorporated in his yacht. Should she have a deep keel? Should she have high topsides for providing buoyancy and load carrying capacity? Should she be a heavy displacement craft or should she be a light displacement boat? What rig should she have? There are many choices, but common sense dictates that a small boat capable of crossing an ocean has to be a compromise. Extremes, simply will not work; for example, broad-beamed, lightweight skimming dishes will lack performance if they are burdened with the requisite provisions necessary for a long ocean crossing. Additionally, such vessels will require constant attention on the part of the helmsman, unless they can be controlled by automated systems, such as electronic steering gears or wind-controlled steering gears. Most likely such systems will not be up to the job, and electronic ones will require power that is generated by solar panels. Deep, narrow, ten foot boats would constantly be under the water in rough conditions and they would lack drive to windward. I’m inclined to think the only solution is to have a micro-yacht like ‘Acrohc Australis’, and if she is to be ten feet or less in length, she must have firmer bilges to provide drive when on the wind and to allow space for provisions. Aluminium, as with Serge’s boat, probably remains the most appropriate material for constructing the yacht. Aluminium is comparatively light; is flexible enough to give on impact, rather than split; does not require substantial structural support on such a small boat, which makes for more space inside. Bulkheads, the transom and the keelson will be sufficient to hold the boat together, and as she will be welded, she will have an integral structure.